The present church at Llandanwg, set immediately behind the beach (and usually partially-buried) may be of 13th century origin, with a 15th century extension. The presence of two 6th century inscribed stones and a cross-incised stone imply early activity here (it is at the mouth of the Artro, the principal river of Ardudwy), as does the dedication to St Tanwg, traditionally a Breton saint who accompanied Cadfan to Bardsey. There are many 17th and 18th century burials at different levels in the churchyard implying a thriving local population, although the church fell out of use in 1841 when a new one was built in Harlech (area 31) which was then expanding its population. There is a listed terrace of three two-storey buildings which appear on the 1842 tithe map and are assumed to be 18th century in date, and there is a small cluster of farms and associated buildings near the station to the east of the road which are probably late 18th or early 19th century in date (they obviously pre-date the railway). The Cambrian Coast railway which now bisects the settlement was finished in 1867 and the station is of this date. 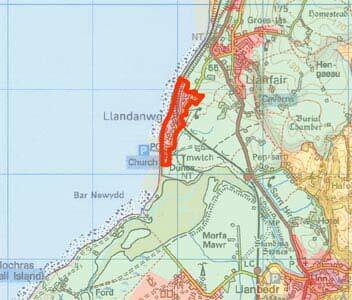 Llandanwg as it is today expanded after this date as a holiday-related seaside settlement and most of the 19th and 20th century building stock reflects this (although even today it is still small). 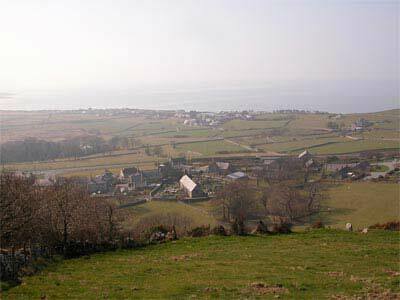 Llandanwg remains a small settlement of probably fewer than a hundred houses set right on the coast below the modern main road. It is bisected by the railway and the station is one of only a handful of non-domestic buildings here: there are several small 'seaside' shops catering almost entirely for the summer tourist trade, but there are no other 'amenity' buildings for which people need to travel to Harlech of Llanbedr. The church is medieval but the earliest surviving buildings appear to be 18th century in date (the listed terrace and farm complex mentioned above). Otherwise, the building stock is mainly detached holiday 'villas' and houses, set irregularly in their own grounds along the western side of the road (i.e. on the beach side) which leads down from the main A496 arterial thoroughfare to the beach (originally built to link the railway station to Llanfair). The houses are mainly single storey, and of a variety of designs in typical 'holiday-style', surrounded by poorly-developed gardens. The houses are mainly 'individual - there are not massive estates.